The below artworks are the most important by Mark Rothko - that both overview the major creative periods, and highlight the greatest achievements by the artist. Artwork description & Analysis: Rothko was among several artists invited by Joseph Brummer to exhibit in Paris at the Galerie Bonaparte in November 1936; Crucifixion was one of the paintings included. 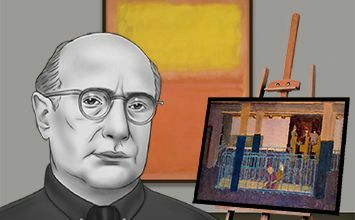 French critic Waldemar George noted that Rothko's paintings revealed nostalgia for 14th-century Italian art, and that they displayed "an authentic coloristic value." This painting has thematic ties to Renaissance religious painting, but it also carries references to Rembrandt's Lamentation of the Dead Christ (1637): the two crosses in the extreme foreground; the third isolated in the back; and the figure groupings, all echo Rembrandt's picture. This work is signed Rothkowitz, as he did not officially become Rothko until 1940. Artwork description & Analysis: This early figurative work demonstrates Rothko's interest in contemporary urban life. The architectural features of the station are sketchily recreated, including the turnstiles and the "N" on the wall. Although the mood of the pictures is softened somewhat by the influence of Impressionism, it reflects many of the artist's feelings towards the modern city. New York City was thought to be soulless and inhuman, and something of that is conveyed here in the anonymous, barely rendered features of the figures. Artwork description & Analysis: Greek mythology was an important theme of Rothko's work in the early 1940s. Oedipus, who is said to have solved of the riddle of the Sphinx, was his father's murderer and his mother's lover. His tale has inspired artists and psychologists alike. For Rothko, he embodied the victim of pride and passion, which the artist believed were at the center of man's destructive nature. As in other representational works of this time, Rothko has dismembered and then recombined his figures so intricately that they became a single mass of human conglomeration. In this way, Rothko sought to suggest how mankind is bound together by tragedy. The figures appear oddly huddled in the corner of a room with strange architecture. The blue and green zigzag pattern recurs in several of his mythological pictures. As Rothko said: "If our titles recall the known myths of antiquity, we have used them again because they are the eternal symbols upon which we must fall back to express basic psychological ideas.. …(they) express something real and existing in ourselves." Artwork description & Analysis: Slow Swirl at the Edge of the Sea is a representative example of Rothko's Surrealist period. The influence of Miro is particularly apparent, specifically in Miro's The Family(1924). Rothko's all-over composition of muted colors, strange translucent figures, horizontal lines, angles, and swirls create a vibrant yet veiled picture of an obscure primeval landscape. Painted while courting Mary Beistel, who would become his second wife, this whimsical scene can also be interpreted as a romance within a mythical and magical world, where the figures are enjoying the ocean as a rose colored dawn is breaking on the horizon. Artwork description & Analysis: Rothko showed eleven paintings at Betty Parsons Gallery in the spring of 1949; No. 9 was among them. Having left behind the figures and landscapes of his earlier work, the "multiforms", of which this is a typical example, featured blurred shapes created from layered washes of paint. The work anticipates Rothko's 1949 breakthrough to the so-called "sectionals". The warm reds, oranges and yellows of No. 9 are disrupted by the strange black mass coming in from the left as well as the brushy swirls of blue in the lower section. The blurred edges, separated color blocks, and beginnings of rectangular registers can be seen, as well as some experiment with size and scale. Far from being merely abstract forms, however, Rothko believed these motifs were objects imbued with his life force - "organisms..with the passion for self-expression." Artwork description & Analysis: In 1969, Rothko exhibited ten paintings at the Sidney Janis Gallery; Four Darks in Red were among those shown. With its dark, restricted palette, the picture exemplifies Rothko's late-period gravitation towards reds and browns. It established a prototype for the dark red/brown/black palette and horizontal composition that he would later use in the uninstalled Seagram Building paintings. Although the imagery of pictures like Four Darks in Red seems far distant from that of Slow Swirl at the Edge of the Sea (1944), Rothko believed that the rectangles merely offered a new way of representing the presences or spirits that he tried to capture in those earlier works. "It was not that the figure had been removed," he once said, "..but the symbols for the figures... These new shapes say.. what the figures said." In this way, Rothko imagined a kind of direct communion between himself and the viewer, one which might touch the viewer with a higher spirituality. Artwork description & Analysis: Set on the campus of St. Thomas Catholic University, the Rothko chapel was funded by John and Dominique de Menil and contains fourteen Rothko mural paintings. There are three triptychs and five individual works. All of these paintings are in hues of dark purple, maroon and black and are of extremely large scale. Rothko worked closely with the architects, having almost complete control over the shape of the building and its meditative environment within. 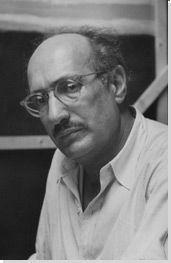 The darkness of the works can be seen as melancholic and expressive of Rothko's mood of his last years. He did not live to see the official opening of the Chapel. Artwork description & Analysis: Rothko invited many of the New York art world elite to his studio to view his latest, and what would be his last, series of paintings, the Black on Grays. While the event was mainly shrouded in silence, it was thought by some that these were premonitions of his death. Others thought that with the prevalence of lunar images in popular culture that they were interpretations of moon landscapes, while others thought they were paintings of photographs taken at night. In general, they were not taken very seriously, which was devastating to Rothko, but also affirming, as he often felt that the interior world of his paintings were comprehensible to him alone. The Black on Grays were painted directly on white canvas and lacked the usual underpainting which Rothko liked to "paint against." Working in two registers only, he severely restricted the colors and scaled down the canvas to a more approachable and intimate size. The extreme contrast of light and dark evokes a sadness that played out like a psychological drama, both mythic and tragic.